Stunning waterfalls are just a car ride away and make for a perfect day trip. There are 25 waterfalls ranging in distance from 35 miles to 85 miles from the center of Minocqua. Lakes and waterfalls were formed by the Wisconsin Glacier, a vast sheet of ice that moved across the landscape during the Pleistocene era millions of years ago. Bond Falls is the most impressive waterfall in Michigan&apos;s Upper Peninsula. The main drop in 40 feet high and over 100 feet wide. The most impressive waterfall in all of Wisconsin is Potato Falls located in Gurney. Potato Falls drops 50 feet and is 100 feet wide. Within a 20 mile radius, there are an additional 6 waterfalls. Many of these waterfalls are clearly marked and easily accessible. Others are off the beaten track and the trails are more rugged. This is a pretty waterfall, and relatively easy to get to. Stop by and see it on your way to or from Bond Falls. Agate Falls is a Michigan State Scenic Site 6.5 miles east of Bruce Crossing on MI-28. There is a roadside park (Joseph F. Oravec roadside park) just past the bridge over the Ontonagon River. Unfortunately the provided trails and overlooks are somewhat limited. With some effort you can scramble down to the river to get some very good views of the falls, which seems to be popular with local fishermen, or scramble up the river banks to get to the old railroad bridge over the falls. The bridge is now part of a snowmobile trail. Brownstone Falls is located in Wisconsin&apos;s Copper Falls State Park. Here the Tyler&apos;s Fork of the Bad River plunges into the Bad River Gorge. This is a very pretty waterfall, surrounding by impressive reddish brown rock. It is only 30 feet high but something about the surroundings make it look much larger. Copper Falls is a third of a mile upstream. There are several vantage points from which to view different parts of the waterfall. A large part of this trail is accessible to wheel chairs. Brownstone Falls is just a short distance downstream. The gorge just below the confluence of the Bad River and Tyler&apos;s Fork is very picturesque. Access to the gorge is prohibited, and would be rather challenging. Gabbro Falls is relatively easy to find but there is some confusing information out there. The waterfall is also known as Baker&apos;s Falls, and it is often mistakenly called Garbo Falls (gabbro is a type of rock). There is also a Neepikon Falls upstream, but it is just an unremarkable rapid. To reach the waterfall head north on Blackjack Rd from US 2 in Ramsay. Head north for about 2 miles. Blackjack Rd takes a sharp left and goes over a wooden covered bridge. From this point on the road is gravel. Continue to the left (you are still on Blackjack Rd) and head up the hill. You will be heading roughly south at this point. At the top of the hill there will be some old, run down looking buildings on the right. Turn around, and park opposite the buildings. There are some obvious trails. To reach the top of the falls, head to the right. To reach the base, head straight. The Manabezho Falls are part of the Presque Isle River&apos;s spectacular final dash to Lake Superior. The entire 1 mile stretch is very beautiful, with lots of bare rock and rapids. It is easily accessible from the Presque Isle entrance off of CR-519 on the western end of the park. Downstream of the parking area is a suspension bridge for pedestrians which leads to Presque Isle. From the bridge you can see the fabulous potholes the river has carved into the gorge. In the summer, when the water is lower, the river goes to the left of the "island" (west), but when the river is high it surrounds the island, resulting in additional falls. In high water Manabezho Falls is very wide, but later in the summer it becomes segmented. From Hwy. US 2 in Bessemer take Powderhorn Rd North. When the road ends at the stop sign make a left hand turn on Black River Rd. Follow Black River Road until you see a sign for the Gorge Falls, turn left. Follow this road for about 3 miles until you come to a wooden bridge. Park before the bridge, then cross it and follow the creek on your left upstream (there isn&apos;t much of a path). Nawadaha Falls is the upper most of the three falls along the Presque Isle River&apos;s final stretch. Until recently you had to walk along a rather rugged trail with lots of steep ups and downs, and there were no viewing platform for the falls. Sometime after 2001 they added a viewing platform and a short trail to the falls from behind the entrance station. South Boundary Road is not to far beyond Nawadaha Falls. You can cross the river here and hike down the other side to make a loop around all the Presque Isle Falls. The eastern side is much wilder, but the whole hike is very enjoyable. Some sources refer to this as Peterson Falls, and the sign on the highway says "Peterson Falls". However others say that this falls is Interstate Falls and that Peterson Falls is a smaller waterfall upstream of Interstate Falls. You can reach the gravel road if you are heading east but it is easy to miss because US 2 is a divided highway here. There is no "Peterson Falls" sign for eastbound traffic. You can get even closer if you wish. The trail leads to the river and you can walk upstream towards the falls. Unfortunately you will have to wade across the river at some point. The walls on the side of the river you will be on become sheer and there is no river bank. In the spring crossing the river may not be possible. If you do cross the river you can get right up to the base of the falls. There are some also precarious spots from which you can get dangerous view of the falls. The falls is located off of Powderhorn Road, about 1.5 miles north of US 2. Powderhorn Road is easy to find, thanks to the giant skier on US 2. The road leads to the Big Powderhorn Mountain Ski Area and there is plenty of signage. The falls on the other hand has no signs. Look for Flintlock Road on the left. This is a small, rough dirt road. Opposite this on the right side of the road is a trail. The road runs parallel to the creek and the creek is not visible from the road. If you reach the Powdermill Creek Resort or the big curve in the road you have gone too far. The trail will lead you to top of the falls. Some ropes will help you make the descent into the gorge. The area just above the falls appears to be part of somebody&apos;s backyard. Red Granite Falls is located in Wisconsin&apos;s Copper Falls State Park. This is better described as a set of rapids instead of a waterfall. Here the Bad River tumbles over and through a large number of rocks. This is the last of the main falls on the Black River before it enters Lake Superior. This is an interesting waterfall. Unfortunately the best views are from the east side of the river and the observation deck is on the west side of the river. The hike from the west side trailhead is 1/2 mile. Another option is to drive down to end of the Black River Scenic Byway, cross the river and hike back up to the falls. A suspension bridge takes you across the river and a mile long, scenic, and mostly level trail, takes you back to the falls. The views are far superior. In low water you can wade across the river above the falls. There is a metal stairway down the gorge behind a fence and a big "No Trespassing" sign. A little research has shown that this stairway is used by paddlers to access the river apparently with the approval of the Northern States Power company. 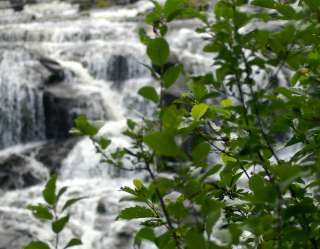 Shining Cloud Falls is the largest and most scenic of the Porcupine Mountain&apos;s backcountry falls. It is at least a 5 mile one way hike to the falls, but definitely worth it if you like hiking and wild waterfalls. The total drop of the falls is about 20&apos;. The falls consists of two parts, a slide on the left, and a plunge on the right. In higher water the two parts merge, but in lower water the two parts are distinct. Plunge falls are rare around Lake Superior. Superior Falls is off of Hwy 122 north of US 2. The US 2 and Hwy 122 junction is in Wisconsin, but you will cross into Michigan. About 1/2 mile past the Michigan border turn left on to the gravel road that leads to the parking lot. There is a sign saying "Superior Falls". Northern States Power operates the Superior Falls Hydro plant and keep the area open to the public. Wren Falls is located on the Tyler Forks, a tributary of the Bad River. The Bad River is aptly named, as it and its tributaries have carved rocky, twisted and often deep gorges through northern Wisconsin on its way to Lake Superior. The falls is only 12&apos; high at most, but the deep gorge it slides into is very impressive, and the dramatic view from the overlook seems to make the falls look much bigger than it actually is.